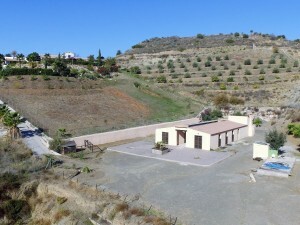 NOW REDUCED....This is a very special country property that has a large plot of land of around 38,000 sqm which is mainly flat so just ideal for keeping horses and other animals. Its also very productive for growing all sorts of crops and vegetables etc. It could also be ideal to set up as a camping area. The main house consists of 6 bedrooms in total, a bathroom, fitted kitchen and sitting room. There is also a patio area outside with room for a pool and nice garden. It does need modernising and when done could even offer B and B facilities as its possible to add more bathrooms. But as a family home this is ideal as its not far from the village that has everything. So much potential! Great views too!